As the Ginetta GT Supercup prepares to resume at Snetterton this weekend after its summer break, Century Motorsport is delighted to welcome some new drivers to its race winning team. 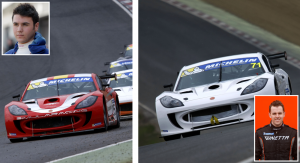 Established Ginetta GT Supercup driver and former Caterham R300 Superlight Champion Jamie Orton joins the team after a mixed beginning to his 2013 championship campaign. Hoping to benefit from the experience of Team Principal Nathan Freke, Jamie has already shown significant signs of progress in testing during the summer break. Joining Jamie is Spain’s representative on the Ginetta GT Supercup grid, Pepe Massot. The young Spaniard joined the Ginetta Junior Championship in 2012 and very quickly became a regular podium finisher in his first season of car racing. Graduating to the Ginetta GT Supercup for 2013, Massot has shown that he is capable of regularly mixing it at the front with two victories so far this season and the potential of winning many more as the season resumes.